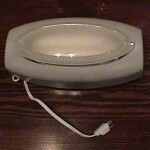 PRODUCT DESCRIPTION: A lighted fly trap which collects flies by attracting them with a special bulb. Both the bulb and the glueboard which holds the flies are out of view. WHERE TO USE IT: In the home, work office, restaurant, commercial food plant or anywhere flies are a nuisance. RATE OF APPLICATION: One per room or as needed.